Warner Home Video Canada typically announces dozens of new products each week. 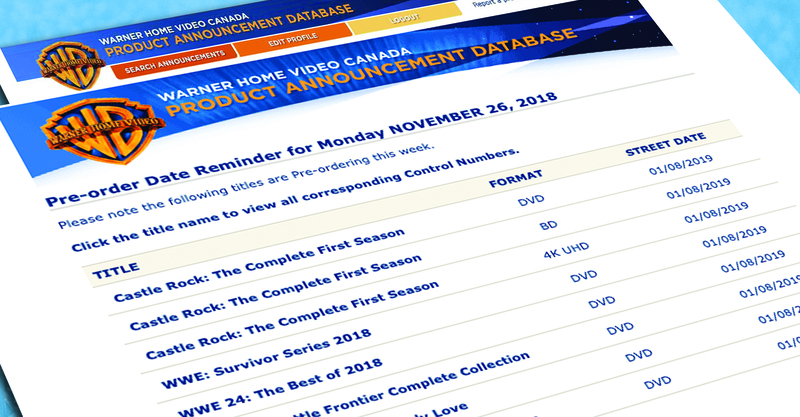 These announcements – as well as price changes and cancellations – were prepared manually by Warner’s account managers and distributed in individual emails to retailers across Canada. The process was time-consuming and inefficient, and retailers were flooded with multiple emails. A second challenge was that incorrect and inconsistent product information was displayed on the websites of Warner key retail accounts including Best Buy, Amazon and Walmart. Field Day developed a web-based database and automated email deployment system for product announcements. The data is stored in a queue, automatically compiled in an HTML email, and delivered to retailers three times per week. Retail partners can view announcements via their web browser, download a PDF, or save the product information into their own databases. Retailers can also search a database of past announcements. Field Day also manages the Warner product info on key online retail websites, ensuring consistency and accuracy of product info. Set up content for Amazon, Best Buy and Walmart Canada.